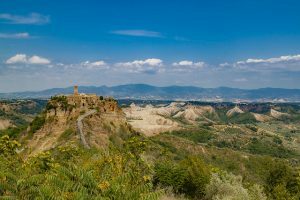 Civita di Bagnoregio and the living landscape of the Valle dei Calanchi. Geomorphological processes in progress. Landslides. Civita di Bagnoregio and the surrounding area known as the “Valle dei Calanchi” is a source of extraordinarily important landscapes, which needs to be promoted and safeguarded. Its characteristics make it almost unique at a national and international level. The evolution of the territory is particularly evident along the morphological saddle of Civita, which from 1764 to today has sunk about 40 metres. 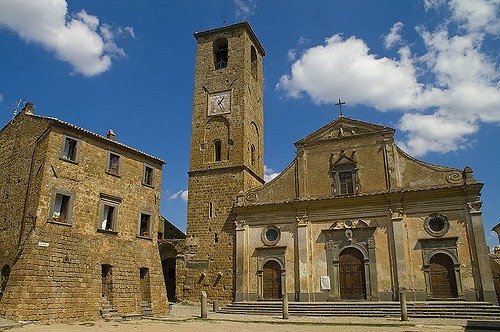 The geological history and marine fossils in the area between Bagnoregio and the Valle del Tevere. The territory of Bagnoregio is characterized by sandy marine clays of Lower Pleistocene origin covered by the volcanic deposits of the Vulsino Volcanic District. Going up the bridge that leads to Civita, the volcanic products covering the marine sandy clays are clearly visible: densely stratified fallout deposits, alternating with paleosols, indicating long intervals between one eruptive phase and the next, along with the litoid tuff rock of the “ignimbrite di Orvieto-Bagnoregio”. 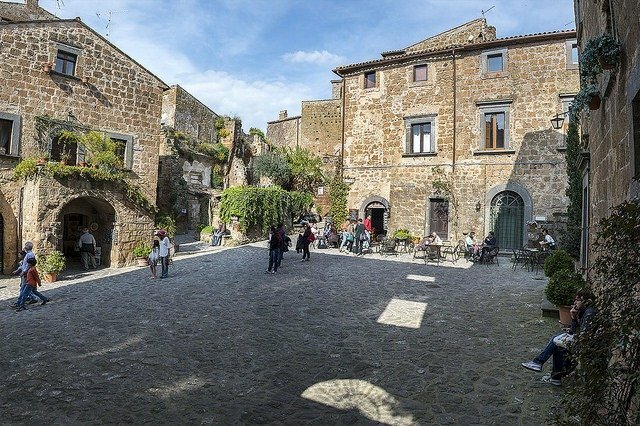 Historical evolution of Civita. Historical landslides. The life of St. Bonaventure. 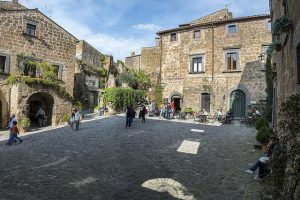 A model of Civita. From the 15th century to date, 134 landslides have been detailed in manuscripts, chronicles, documents and various publications. A comparison of these documents shows a progressive reduction of the inhabited centre, caused by landslides along the perimeter of the cliff. 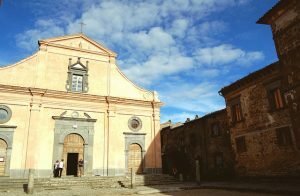 San Bonaventura is the town’s most illustrious person. 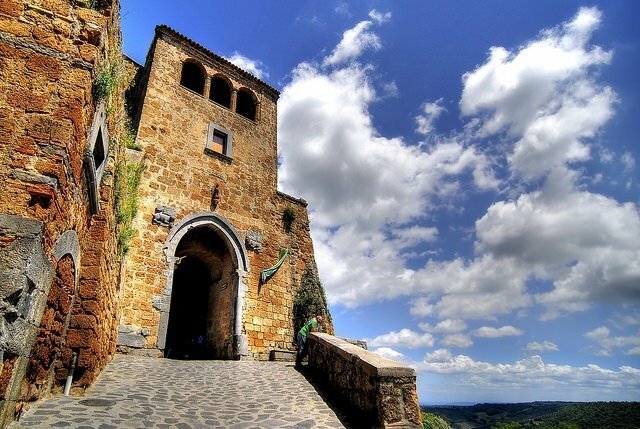 He made the name of Civita famous throughout Europe. A priest, philosopher and theologian, he was bishop, cardinal and general minister of the Franciscan order. He is considered one of the most important biographers of St. Francis of Assisi. 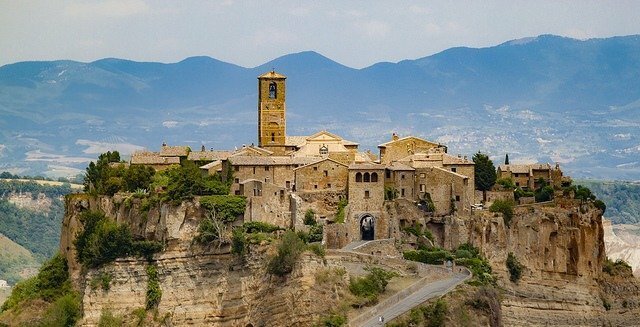 Videos and photos to learn more about Civita. Monitoring. Stabilization interventions. The monitoring of landslides is the starting point for the implementation of programs to prevent and mitigate the risks related to slope instability. 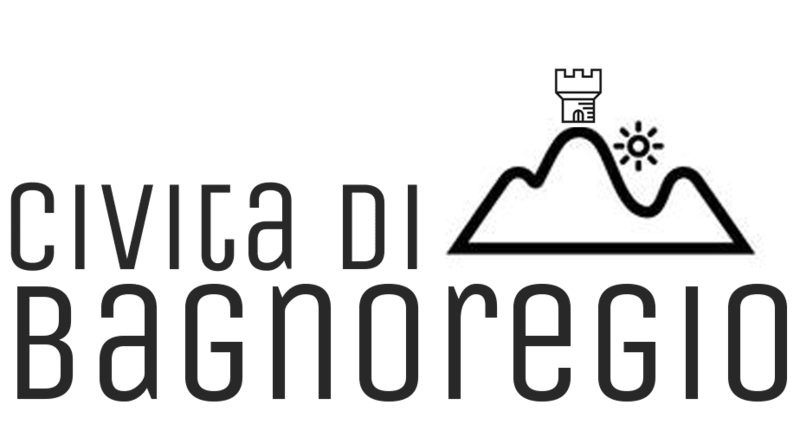 Through a careful historical and archival research, the interventions on the slopes in the various historical periods have been recovered. From June 1st to August 31st, from Tuesday to Sunday, 9.30am-1.30pm and 2.00pm-6.30pm. From 1 September to 31 May, from Friday to Sunday, from 10am to 1pm and 2pm to 5:30pm (from Tuesday to Thursday open for pre-booked guided tours for a minimum of 15 people). 6 January, Easter Monday, 25 April, 1 May, 26 December. 24, 25, 31 December; 1 January.